I am off gadding this weekend, and the salon will reopen on Monday 15th June, so do enjoy my memories of a recent weekend trip to the city! 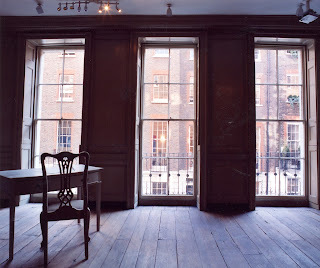 Last month, I had the pleasure of visiting the Benjamin Franklin House on Craven Street, London, where I joined the unique Historical Experience tour. 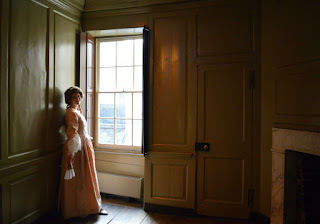 I have never visited the house before and really didn't know what to expect from the tour but, as fan of all things 18th century and theatrical, the chance to be accompanied through this historical gem in the presence of the Georgian landlady's daughter was too tempting a prospect to miss. 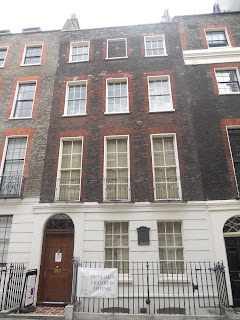 Situated just off of one of the busiest streets in London, the house at 36 Craven Street nestles in an oasis of genteel calm where once, before Georgian gentrification, prostitutes and cutpurses roamed. By the time Franklin took up residence there in 1757, things were considerably more refined. 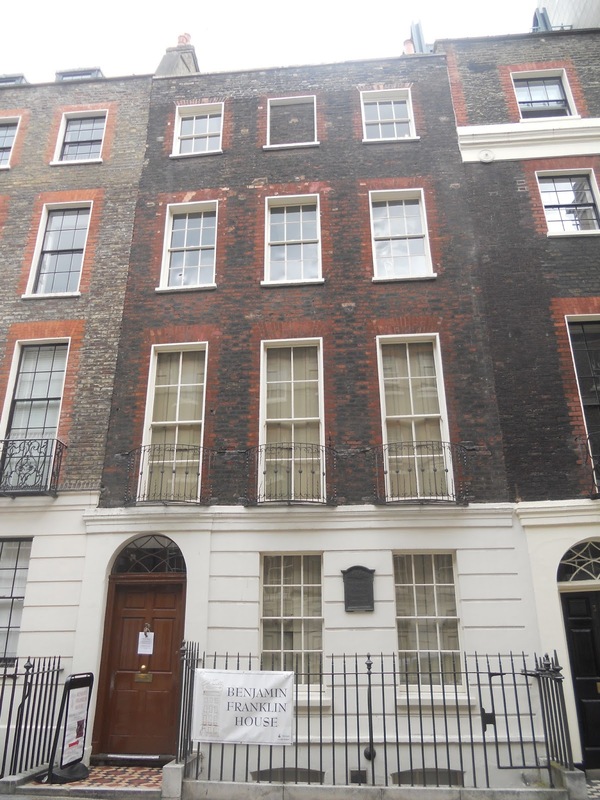 Franklin's landlady was a respectable widow named Mrs Margaret Stevenson and she lived at Craven Street with her daughter, Polly, who was to become one of Franklin's closest friends. The house, where Franklin eventually lived for sixteen years, is remarkable in that it retains many of its original features. 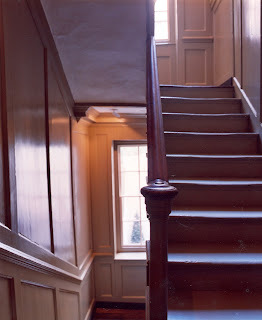 Its rooms have been left unfurnished so that one might get a sense of them without distraction, leaving the visitor free to admire the architectural features that were so familiar to Franklin from the creak of the boards to the preserved fireplaces and a remarkable staircase, where one might pause after the tour to soak up the peaceful atmosphere of the house. 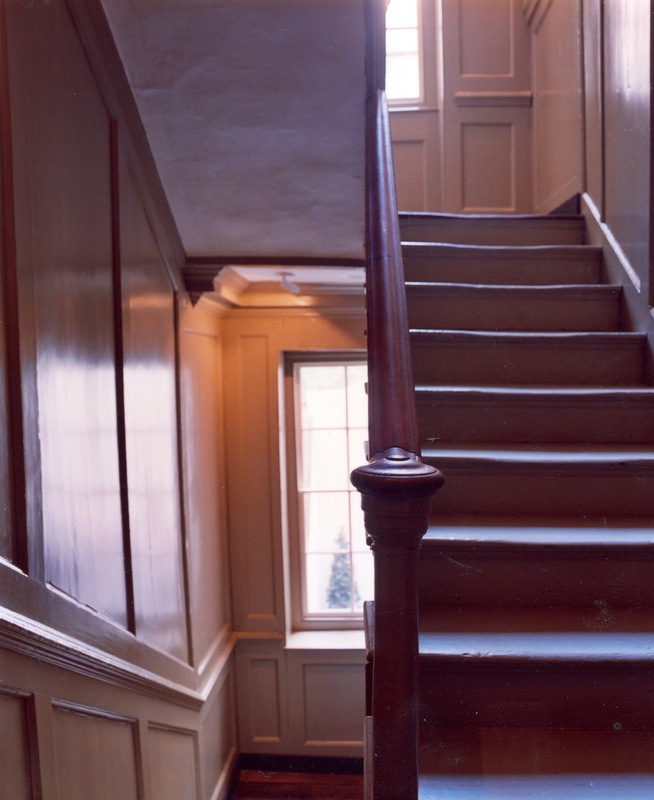 It is not so difficult to imagine Franklin coming and going, to hear the light tread of Polly on the stairs as she came in search of her learned friend. The tour begins in the basement, once the garden of the house, where one has the opportunity to view the house's small permanent collection. This includes a great many bones which were found during work on the property and proved to be the leftovers from the anatomy school run from the building by Polly's physician husband. A short film introduces the building and gives an overview of Franklin's remarkable achievements life before he came to England and then visitors are whisked into the world of the 18th century in the company of Polly, who escorts the party from room to room, proving a most unusual tour guide. The tour is quite unlike anything I have undertaken before and I absolutely loved it. Interacting with prerecorded sound and video, the actress playing Polly paints a picture of life in a busy household which became the centre of Franklin's world. Spending sixteen years in England without his own wife and family, he became a member of this family instead and extracts from his papers as well as social and political context are woven seamlessly throughout the tour. Following the conclusion of the scripted performance, a member of staff joins the party to answer questions and guests are allowed to take photographs of the remarkable building, as well as given a chance to soak up the atmosphere. A particular delight for me was the opportunity not only to view but to have a musical turn on a replica of Franklin's Glass Armonica. 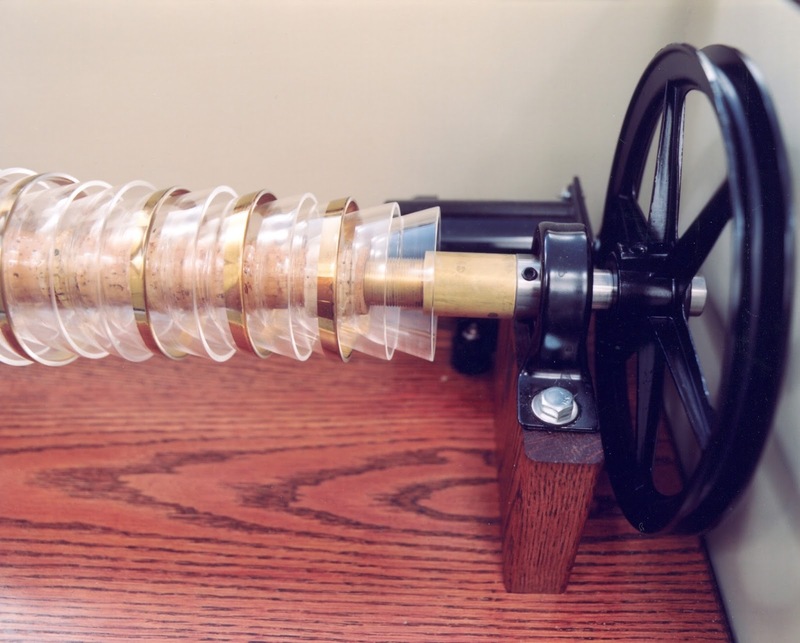 This remarkable musical instrument, operated by a treadle (though the replica is motor-driven), uses connected glass bowls and water to produce notes in much the same manner as running one's wet finger over the rim of a wine glass. I don't think Franklin would have been too impressed by my efforts, but it was wonderful fun to have a go! On our tour, the role of Polly was taken by Nicole Magdalena, and she really does deserve applause. She inhabited the role completely and though working with only sound and video must surely be a challenge, Nicole's effortless performance could not be faulted. From her movement to her voice and manner, she perfectly captured that certain particular gentility that one associates with women of the Georgian era, and whether sharing Polly's wonder at the discoveries made by Franklin or deep sorrow at his eventual departure from English shores, she absolutely drew the guests into the world of the house and its inhabitants. My enormous thanks must also go to all the team who arranged our tour and made us feel wonderfully welcome. 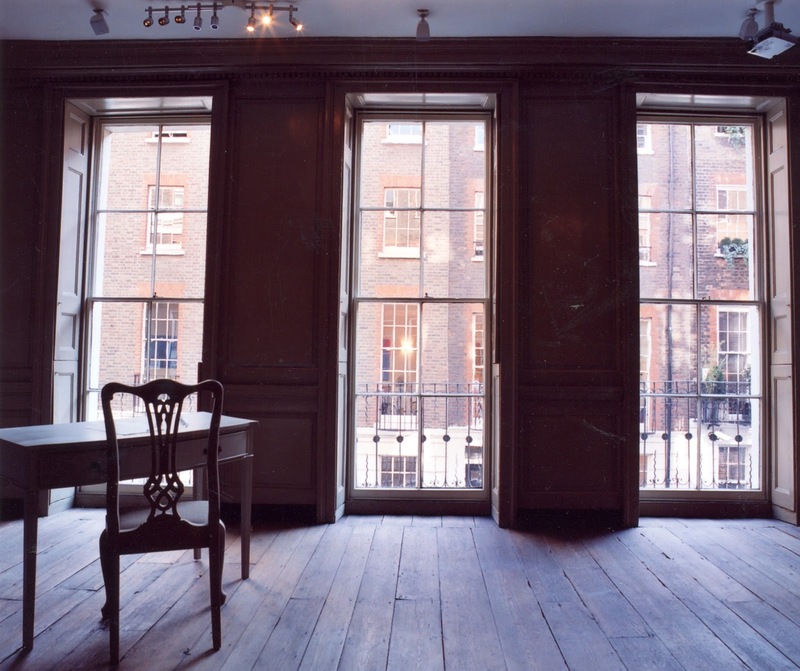 In addition to the Historical Experience, the house also hosts a weekly Architectural Tour and I intend to return and undertake one of these too; this house is truly a gem of 18th century London and I urge you to go along and visit Craven Street, you won't regret it. Wow!! Madame,you are such a lucky lady to have made such a wonderful visit! Ohhh Thank you so much I have been reading his autobiography here and there ( really fascinating ) and I love seeing pictures of where he lived too ! I know! We were made so welcome, it was a wonderful day. He was such a remarkable man, the house makes him feel very near. I really recommend it, it's marvellous!